Do you have a missing tooth or missing teeth? Are you uncomfortable about being around people because your smile has gaps in it that are embarrassing? Do you even avoid activities that you would enjoy because you don’t want to smile around others, even loved ones? Or maybe you are finding it hard to eat and chew because you have missing teeth. If any of these are the case, you may benefit from getting a dental bridge, also called a tooth bridge. Call or visit our office in Lodi near Stockton and Galt to have all your questions answered. A dental bridge or tooth bridge is a device that bridges the gap created in your mouth caused by a missing tooth or teeth. It can be for one tooth or several. A dental bridge is connected on each side by a dental crown. 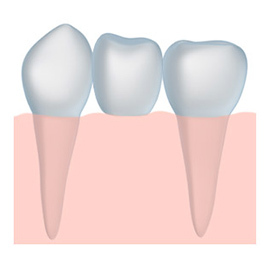 What Are the Advantages of a Tooth Bridge? A dental bridge looks like your real tooth, so you can laugh and smile with confidence. A tooth bridge is matched to your natural tooth color, so it doesn’t stand out in your smile. A dental bridge functions just like a natural tooth or teeth, so you can eat and chew as you normally would. Because the tooth bridge will give you a “full” mouth, with teeth in all the proper places, you have less chance of wearing down your teeth on the other side of your mouth. With a tooth bridge, your cheeks will not have a sunken look due to a missing tooth or missing teeth. If a missing tooth was causing you to speak differently, a dental bridge can restore you to speaking naturally. If you have missing tooth or teeth, sometimes your other teeth can shift or move. With a tooth bridge, this prevents your other teeth from shifting, which can cause problems with your bite or other oral health issues. If you have missing teeth, give us a call today! We want you to have a smile you can be proud of. Our office serves the Galt and Stockton areas.